Courtney Force is a Funny Car drag racer for John Force Racing. She is the youngest daughter of 16-time NHRA Funny Car national champion John Force and his wife Laurie. She is a graduate of Cal State Fullerton having majored in Communications. On July 19, 2009 Courtney won her first National event in the Top Alcohol Dragster category at the 22nd annual NHRA Northwest Nationals in Seattle, Washington. She ended up amassing enough points in that season to win the Top Alcohol Championship. Courtney became the fourth driver for John Force Racing, driving the Traxxas Ford Mustang. Courtney Force, 25, has emerged as one of the most exciting young stars in the Mello Yello Series as the driver of the Traxxas Ford Mustang. Blessed with her father’s gift for gab, the former high school cheerleader has become one of the most popular interviewees in the series. Always considered the daughter most likely to join her father in the family business, Courtney hasn’t disappointed. The third-year professional driver approached the 2014 season a true championship contender after two strong top ten finishes in 2012 and 2013. Since her Funny Car debut, Courtney has qualified for every national event, started from the front of the Funny Car field three times, taken her Traxxas Ford Mustang to five final rounds and claimed three Funny Car victories (O’Reilly Northwest Nationals at Seattle, Wash., the Auto-Plus New England Nationals at Epping, N.H., and the 2013 Winternationals in Pomona, Calif.). “It’s strange to think I’m already in my third professional year in the Funny Car category. I’m constantly learning new things and I’m eager to see what we can accomplish in 2014. In 2012, Courtney received the Automobile Club of Southern California’s Road to the Future Award as the NHRA Rookie of the Year after finishing fifth in the driver standings, equaling the best ever showing for a Funny Car rookie. She is also in her third year representing Ford Driving Skills for Life as the program’s spokesperson. Having the ability to drive a 10,000 hp Mustang capable of zero-to-320 mile per hour acceleration in little more than four seconds won the attention of ESPN The Magazine, who placed Courtney on the cover of ESPN’s The Body Issue along with a piece on fitness and health in the NHRA Mello Yello Drag Racing Series. 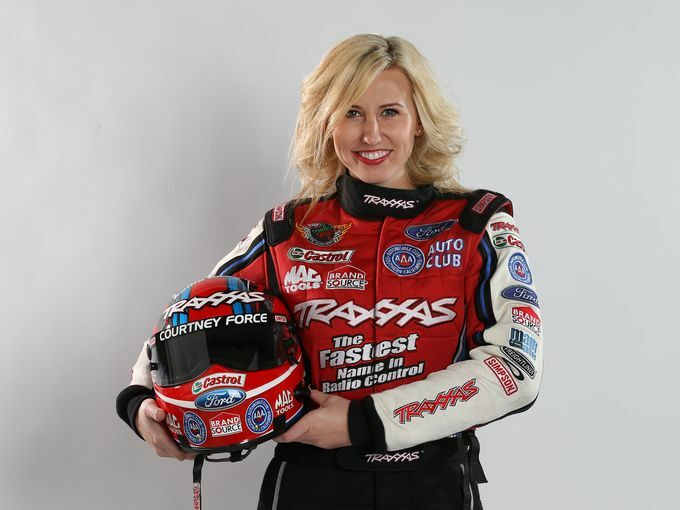 In addition, Courtney has appeared on the cover of Traxxas Magazine, Speed Sport News, National Dragster, Drag Racing Action and Autoweek over her three year career. The 25-year-old earned a degree in Communication from Cal State-Fullerton and is now making the most of her opportunity to compete at drag racing’s highest level. Her preparation for a pro career included a six-year apprenticeship in Super Comp and Top Alcohol dragsters. She attended Frank Hawley’s Drag Racing School, where she was tutored by one of her current rivals, 2012 Funny Car Champion Jack Beckman, followed by private tutoring in sister Ashley Force Hood’s informal “Funny Car 101″ class and a full season of testing in a Funny Car. After turning pro, the graduate of Cal State-Fullerton won a race in her rookie season and two more in her second year including the prestigious NHRA Winternationals at Pomona, Calif. Racing for crew chiefs Ron Douglas and Dan Hood, she has covered the 1,000 foot course in an official 4.016 seconds at 319.98 miles per hour.